bin predators are a danger for your worm population, but the centipede loves feeding on earthworms. Centipedes are nocturnal hunters. They catch their pray with their fangs at the front of their head and hold on to them.They paralyze their victim with powerful venom before they devour it. 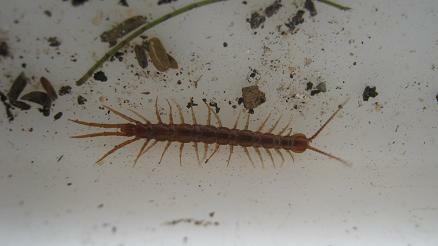 Centipedes live on the surface of worm beds and can usually be seen for a few seconds after the lid or covers have been removed from the worm bin. A centipede can often can attack and eat earth worms. The Centipede is quite fast and will immediately run away and try to hide out of sight once it feels threatened. Whenever you see one quickly grab it between your thumb and index finger and release it in a place a good distance away from your worm farm. Centipedes are usually present in worm farms in small numbers only. So they don't pose a major problem and if you don’t want to kill them and don’t mind the loss of some worms then just ignore them. In some warmer parts of the world you will find a Gecko from time to time inside your worm bin. It will most likely be the common house gecko. Geckos are fierce predators. They are nocturnal hunters and usually hide in dark protected corners during the day. 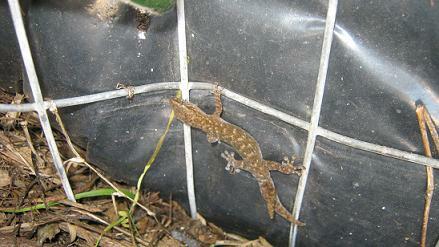 The House gecko usually doesn't grow bigger than 10cm / 4 inches. Gnats and other small insects they can get hold off.In that way geckos are actually reducing pests inside your worm bin and should be viewed as helpful worm bin predators. Gecko's are very shy and usually give chase when you disturb them. They often can be seen in small openings close to the lid. Be careful not to crush them when you place the lid on your worm bin again. 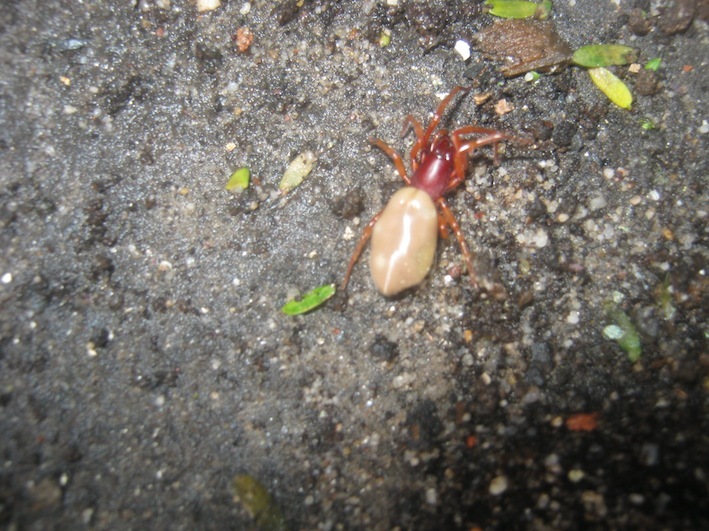 A very rare visitor to worm farms is the woodlouse spider (Dysdera crocata). This unusually colored spider is a specialized hunter of woodlice. The woodlouse spider "Dysdera crocata" can occasionally be found in worm bins. It preys nearly exclusively on woodlice. It grows to about 1 cm / 0.4 inches in length has a red like front body and a yellowish back. I haven't seen one in years. Where are the spiders when you need one :-) ? The woodlouse spider its really something special to get glimpse of it. Till I catch one again in one of my worm bins you'll have to find images of it on the net. Amongst the well know worm bin predators are mites. Mites are an closely related to spiders and scorpions. They vary in size from microscopic dust mites to larger mites like the Red mites. Dust mites are probably found in even the cleanest homes. Of the estimated 40000 different kinds of mites there are only 3 kinds you can see with the naked eye in worm farms. At certain times you might find in your worm farm white-, brown- and red mites. The white- and brown mites are not really a problem for your worms as long as their numbers don’t grow to large. The mite that can be a threat for earthworms is the Red Mite. Red Mites are predators. They can attack your worms and kill them by virtually sucking them dry. So far we rarely had to deal with them in our worm beds. If you encounter them in your worm bin its best to get rid of them. An effective way is to burn them with a blow torch. That doesn’t sound nice but Red mites can spread diseases and can definitely kill a lot of your composting worms. Go back from worm bin predators to the "worm bins" page. Go back to the "Home Page." For Questions and suggestions contact us!